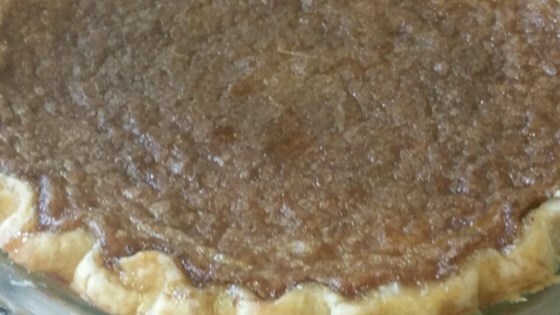 "The story behind this pie is that an Amish farmer came in from working in the fields, took one bite of this delicious pie and said this pie is as good as Bob and Andy which were his two prize gelding work horses. It reminds me of a rich, spicy chess pie." Beat all ingredients together very well and pour into a 9 inch unbaked pie shell. Bake at 350 degrees F (175 degrees C) for 45 minutes. Pie will quiver. This is ok! The top will be puffed up when you remove the pie from the oven and will fall down after it has cooled. This is ok, too! Best served at room temperature. I loved this pie so much. It's light, custardy and spicy. Absolutely fantastic! Very very easy to make. This pie was OK. Nothing to rave about. Basically a custard pie,with a crunchy topwith a cinnamonish flavor. I liked this pie. I had all the ingredients even though it was 3 days before grocery day. Baked it 15 minutes longer than advised. Great taste. Took it to church social. Really enjoyed it.